Hawai'i Nights takes one of the most beautiful and most photographed places on Earth and surprises you by presenting it in a completely new and captivating "light". HAWAI'I NIGHTS is a project that brings you a never seen before professional quality photographic documentary of the night sky in all the publicly accessible inhabited islands of Hawaii. Along with magnificent night vistas of Kauai, Oahu, Hawaii, Maui, Lanai and Molokai (the six publicly accessible inhabited islands in Hawaii), HAWAI'I NIGHTS is a live photographic experience that brings to you images of Milky Way arches above enchanting beaches, volcanoes at night, moonbows, cliffs, abandoned resorts, palm tree forests and many more surprising and captivating nightscapes, all in a "first of its kind" collection that is sure to transport you to a heavenly side of Hawaii not many people have ever experienced. Hufftington Post: Hawaii Nights Will Show You The Islands Like You've Never Seen Them Before. 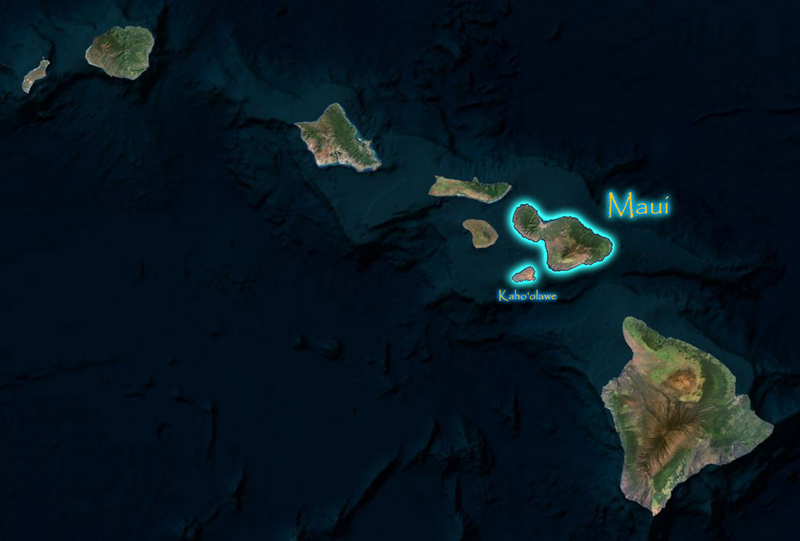 The Weather Channel: Hawai'i Nights Unveils the Darker Beauty of Paradise and a video. S&T: Hawaii Nights, an Astrophotography Island Adventure. Astronomy Magazine: A great new astrophoto book. The book contains over 70 images and more than 100 pages where, along with the images - many of them double-spread - the author narrates the many travels, situations and adventures that took place while capturing the images for Hawai'i Nights, and how a family trip became an adrenaline rush where emotions run high in order to complete the project. The images of course perfectly illustrate every step of the story. 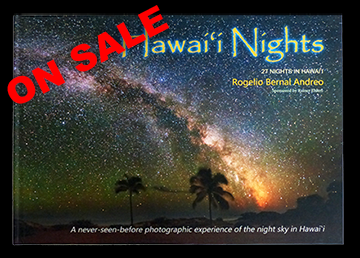 The first print run of HAWAI'I NIGHTS is being shipped right now but copies are running out fast, get your copy today! Just click on the button of your choice. Paypal guarantees a safe transaction. If you don't have PayPal, contact us. We also accept checks and credit cards. If you purchase a digital copy of Hawai'i Nights and a book (hard or soft cover), shipping is free! (USA only, sorry). Contact us for details. Even superb photography and storytelling may look dull if presented in average quality printed media. When you buy your copy of Hawai'i Nights, you will see we did not go cheap in the production of the book. We wanted a book that breathes quality, not only in the content but also in how it looks and feels. Out of the hundreds of copies already shipped, we have only received compliments, and we're certain you will not be disappointed. Also, by dealing directly with the printing company, we are in control of the quality. We - not a general bookseller or shipping company - individually handle and pack every book we ship. 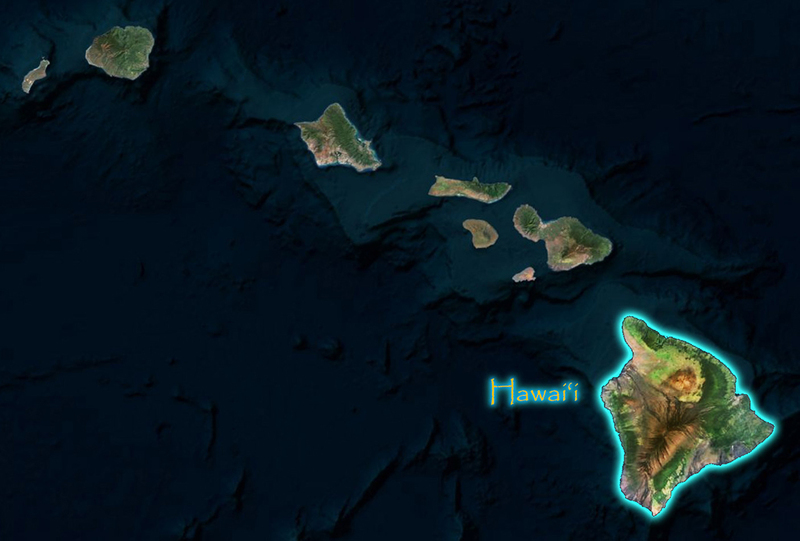 There are more than one hundred (100) different images in the entire Hawai'i Nights collection. It is, indeed, the largest collection of nightscapes from Hawaii on the Internet. At the moment of this writing, less than half have been published. Of course, the book includes many more images than the ones shown here. DeepSkyColors is licensed under a non-commercial, non-derivative Creative Commons License. For commercial use of my images, please contact me.